King Randor is back tonight with a review of a new line from Jakks that just hit the shelf - Rocky! Take it away, King! In 1976, after years of playing extras in films( including even one that was apparently X-rated), Sylvester Stallone decided to present to MGM his screenplay for a movie about a boxer- it was called Rocky. MGM was immediately interested, but wanted to buy the script from him, and have someone else star in it. Stallone told them either he was in it, or he took his business elsewhere. MGM agreed, and ended up with, what is considered to be, a legendary cult classic- which also managed to propel Stallone’s career to heights he’d never before seen. Four sequels followed the first one( as far as I’m concerned, all of them way better than the original, but that’s just me)- and a new movie is scheduled for release this December. Now, the franchise has indeed gotten toys in the past. 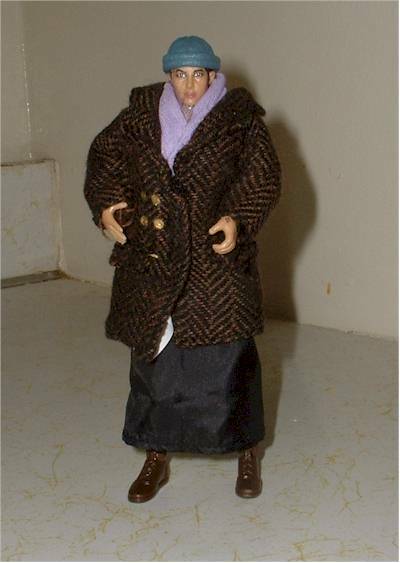 Around 1976-1977, a 17” plush doll was released to cash in on the first movie’s success. In 1979, a die cast car of Rocky’s Trans Am was released. Then in 1983, Phoenix Toys released figures based on Rocky III- which were all done with a He-Man –esque body( yes folks, that’s right, you could officially pin Hulk Hogan or Mr. T- or even Carl Weathers…should you be oh-so-inclined, against Skeletor!). 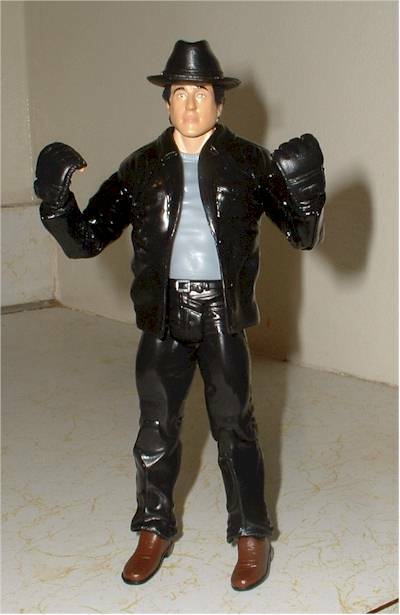 Finally in 1985, Winston Toys did some figural erasers of Rocky and Ivan Drago for the 4th flick, with a small boxing ring that doubled as a large eraser( imagine how much fun that must’ve been to bring to school, back then!). That was about it for such a long-running classic franchise…for many many years. 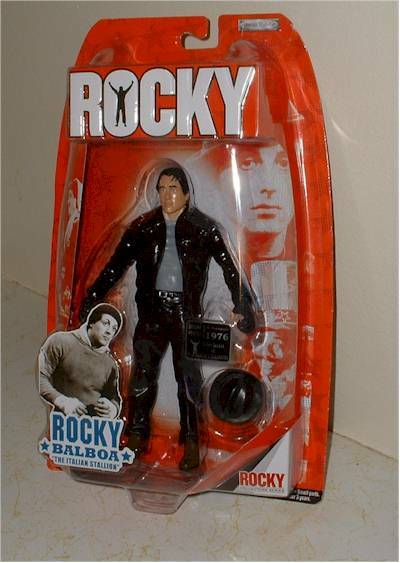 Then last year, Jakks Pacific announced they’d landed the Rocky license, to capitalize on the upcoming movie as a toy tie-in, and also due to Jeremy Padawar’s passionate belief that Rocky truly never got his action figure due. 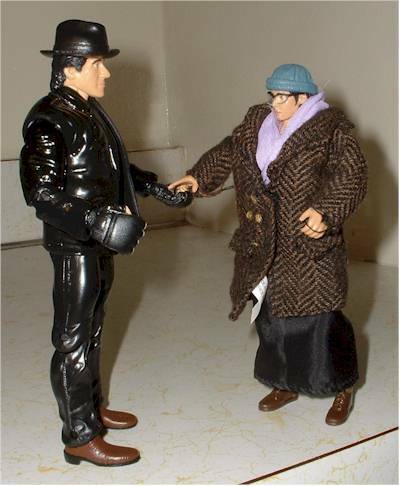 Having fallen in love with the franchise myself, I’m not going to disagree with him, and instead, joyfully immediately snagged two of the figures at KB Toys last week- Rocky as Gazzo’s collector( gotta love that outfit), and Adrian. Each wave of figures is based on each individual movie. So, series 2 will, naturally, be a Rocky 2 set, and so on and so forth. So, you’re probably wondering- how do they stack up…and is it more worth it to fork over $75 for a full set of the 1st series, rather than on a MOC Apollo Creed from ’83? You decide…. I initially had mixed feelings regarding the packaging, when I saw it. Reason being- for some strange reason, after looking at the photos of the packaging, taken from Toy Fair, I could have sworn it was clamshell packaging- which would’ve totally blown me away. Apparently, I was just thrown off by it or something, ‘cuz I checked the shots again, and it was definitely what I bought at KB Toys. Ok, fair enough. I just don’t think a blister card works as well, with what they’re working with here, as it does with the WWE Classic Series- but that’s just me. Regardless, the packaging looks phenomenal, even as a blister card. They decided to go with “collage” packaging- featuring various scenes from the first movie…and done in the color scheme reminiscent of his trademark boxing shorts. I could’ve sworn this color scheme was also prevalent on one of the posters, but after looking at a Rocky fan site, I guess I was wrong. The effort put into it was very well done, and it really makes it stand out on store pegs- which is very important. It also shows off the figure and accessories well, and that’s also one of the most important aspects of it- and to the bottom left of the packaging is a small photo of the character in black & white, with the name printed beneath. The back of the card shows the figure with a good amount of text next to it, about the character, and in the lower right section shows all the figures available in the wave. Very nicely done, even if it isn’t a clamshell. Face it, Jakks was probably the best company to do this license, as boxing is a sport with a few major similarities to wrestling. Ergo, the “Jakks” body was perfect for this line. Sideshow’s got their trademark figure bodies, and now Jakks does too. To top it off, having such a basic body also keeps the costs down, which is always great for we collectors. There was LOADS of body re-use with this line, so it basically comes down to the likenesses. I think they got Stallone pretty close to perfection on this one, and from what I could tell, Talia Shire also finally got her due. 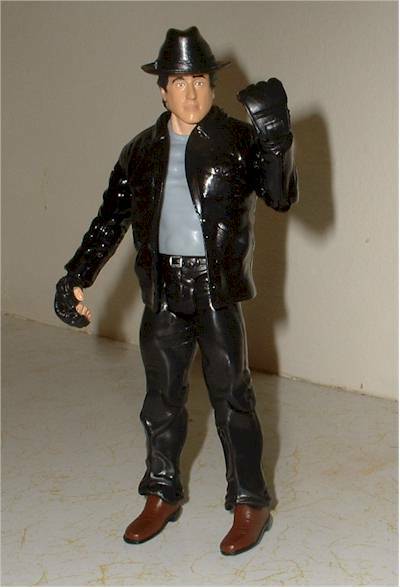 Stallone’s likeness is a tad soft- just a tiny bit, but by a tad, I mean like on a scale of 1-10, they hit a 9, so I really can’t complain. They even managed to get that “un-even-ness” of his eyes down pat, as well as his nose. The face, to me, just seems a tad too fine and smooth. Either that, or maybe I’m just being pulled in by the fact that the body is, again, the “Jakks body”- Hard to tell. Again though- this isn’t a specialty market piece, so for a mass-market figure, this is absolutely phenomenal. The gloves on the hand are sculpted accurately as well, to fit the source material. The shoes are also nicely sculpted with all the expected curvatures, and crevices, & whatnot. It’s the small things like that which really make a figure so great. As for Talia Shire, I think they hit a home run- from the picture of her, and what I remember from the movie, they captured her likeness perfectly- to the T. Her hat is sculpted onto her head, and matches the source material just fine. And just like Rocky’s, her shoes look great, too. I wish I had more to say about the sculpting job, but like I said( about a dozen times already), it’s the standard “Jakks” bodies. However, we still have more categories to hit…like the paint! So yes, the tables have turned! Now granted, I know what you’re thinking- “how hard can it be to just paint an outfit black?” I honestly couldn’t tell you, as I’m no artist, but they did it great, for Rocky. The shoes just a tiny bit of paint bleed- barely noticeable, and it appears overall everything is “within the lines”. The shirt and belt buckle look great, too. The paint wash was done really well too, giving the jacket a glossy finish, and the shoes got a sorta glossy, yet sorta dull look to them. Very accurate- as well as era accurate. Adrian nearly made out on top, but two tiny flaws pulled her back. Now, first off, her hat is painted great with no paint bleed whatsoever, and the hair is painted well, too- as is the majority of her face. Unfortunately, the prototype of Adrian came out better looking regarding her eyebrows- one of them is painted a bit more flat, longer, and higher up, giving her somewhat of a scowling look- which in no way fits the look they were going for. Oh yeah, also worth mentioning- her eyes have the “zombie” look to them. I think it also had that look in the prototype. Regardless, it doesn’t look good no matter where ya get it.. The paint wash came out great for Adrian as well, giving her hat and shoes a very dull look- which fit the character and the scenes very well. 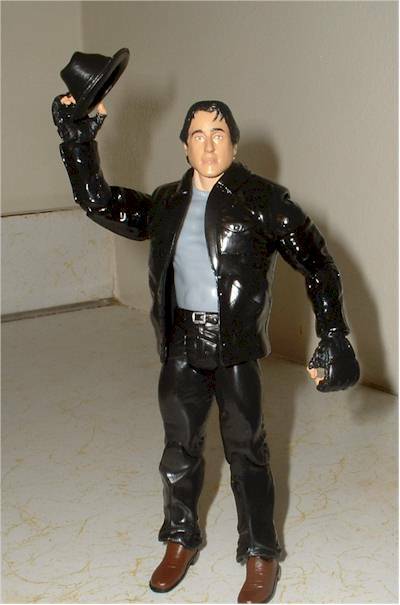 Ok, yer not getting Marvel Legends articulation here- I think you know that. Yer getting WWE Classic wrestling-styled articulation, and it fits the both subjects perfectly fine…after all, how many poses are you really planning to put Rocky and Adrian in….you know what, on second thought, don’t even answer that…..
Rocky has ball jointed neck, ball jointed shoulders, elbows, wrists, waist, thighs, knees, and calves. Adrian has ball jointed neck( though a bit restricted by her outfit), ball jointed shoulders, elbows, wrists, waist, thighs, knees, and calves, just like Rocky. As far as I’m concerned, it works fine with the character material, and you can do a few decent poses with what you’re given- although Adrian’s arms are a tad bit restricted as well, due to the outfit. Rocky comes with his hat. It’s not a lot, but it’s good enough for me. It’s nicely painted, which makes it all the better- it doesn’t appear to be hard plastic either…very soft feel to it. Adrian comes with her outfit- which appears to be hand-stitched, and her glasses. In my collection, those glasses are staying on, as like with most of the glasses Jakks gives their figures, they have a hell of a time staying on. It’s like somehow they just slightly miss the exact length in centimeters to make the glasses stay on the face- like always. Also, Adrian’s outfit is ALSO staying on. 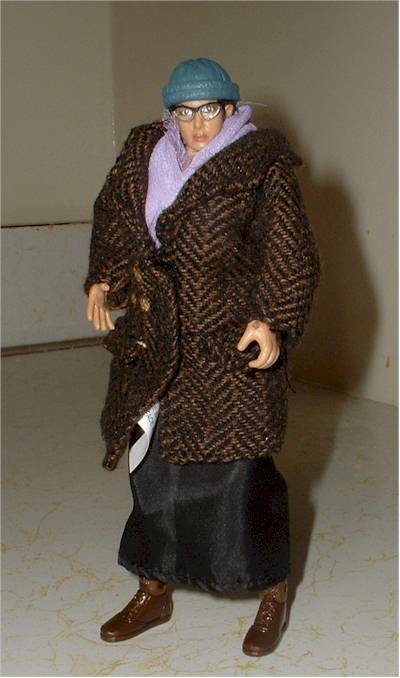 Now, seeing as this is hand-stitched, I KNOW half of you are thinking “OOOOOO, I can finally see what Talia Shire looks like under all that clothing!”. Just to get it out of your system, I’ve provided a photo for you…and I must say…it was absolute hell getting her outfit off, and back on again- her hands kept getting stuck within the stitching, and they seem a bit delicate, so I was afraid they might warp a bit- so just be careful when posing. It must be said though- I apologize to Talia Shire if she’s reading this- I do not find her attractive in any way, and still don’t understand what beauty Rocky saw in her. Love the character, do NOT find the actress attractive in any way. It almost makes ya wonder, in a scary way- Adrian, or Meg Griffin? Scared now? Thought so. So, here ya go- now you’ve seen what she looks like underneath the coat and skirt. Let’s PLEASE move on…. I paid $8.99 each. This appears to be the going rate these days, and for such great figures, it’s a great price. Hopefully some discount retailers will get ‘em in a buck or two cheaper, which’d be great. So far, I’ve only seen ‘em at KB- hopefully we’ll be seein’ em elsewhere soon. Cornerstorecomics.com has ‘em for $10.99 each- and also as a set for $104.99. Rockyfigures.com and RingsideCollectibles.com both have ‘em for $12.99 each- and also as a set for $129.99- as well as the exclusive Caveman outfit Rocky, and the Star Spangled Banner robe Apollo Creed. Amazon.com has them for $8.99 each, with some of the short-packed figures a bit higher in price.